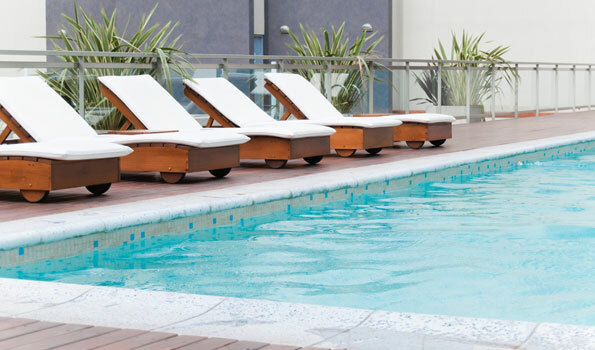 Here are ten helpful tips for managing and maintaining commercial pools. If you have a new pool, make sure there is a vacuum gauge on the suction manifold and a pressure gauge after the filter tank and be sure the whole thing is color coded. If the erosion feeder is not secured to the floor- fix it. All you need to do is drill about two or three holes in the floor (like you would a cover pin, only smaller maybe 5/16”). Then use a drop in anchor from the hardware aisle from Home Depot. This should be about 30 minutes in the pump room, plus a Home Depot trip. Replace all split baskets and stock extra at the pool, all skimmer parts (weirs, lids, baskets, throttles). You know they will break or may get lost in-season. If you keep a few extra at the pool, they can be replaced same day. They are cheap, and it is easy to explain, and help the pool stay cleaner. If you request a bid for a complete coping –tile –caulk job in the fall and it didn’t make the budget. Plan for a partial job in the spring. Just explain- “We received a bid for the whole job in the Fall, it didn’t get approved, let’s just do the worst 10% to 20% of the pool to get us through this year”. Remember- clients, committee’s, BOD’s and managers need time to budget for larger jobs. Most of the time you will be asking the question, “What do I really need to get open?” Knowing exacting what you need will allow you to be informed when deciding and you can report back that you went through your list completely. Plus, you need to know your regulations and inspectors preferences. Your pool company should be great at this, if not move on. Any air bleeders that are not working properly are a safety hazard. When the pump starts up a large volume of compressed air is forced into the filter tank. If this doesn’t have a way to escape, the surge in pressure can be explosive; particularly on a dirty tank. Plus if it doesn’t close all the way it is a leak. And we all know leaks (wet floors) should trigger a repair of some sort. This may be a requirement in your jurisdiction; a shepard’s crook needs to be connected to a solid pole (not a telescopic) and it must be connected with bolts not plastic spring clips. If you want to repair small concrete; a handrail pad, ladder pad or guard chair, remember to think about how the anchors will be bonded. Small pads can be expensive if not coupled with other work. Think of other things needed so the crew can combine repairs. If you see a leak or an extra valve on the backwash line coming from a multi-port valve it is there for a reason. The spring and rubber seal in the multi-port are shot. Replace the whole multi-port. The “spray out” that is occurring affects the filtration; not all the water is making it through the filter. Replace it. Do not replace the special rubber seal inside the multiport. It is glued in from the factory, the replacement never works the same and takes time. Replace the whole multiport. Leak detections usually lead to a repair of some sort. You may not discover that you have this problem until after you are up and operating. The middle of the summer is when you should be planning for fall work. Start with the leaks.